Cascarones, also known as confetti eggs, can be the highlight of your next family gathering. This fun-filled activity can be a little messy, but the whole family will enjoy, and it’s guaranteed to bring a few laughs. *You can either buy a carton of eggs and crack small holes and toss out the yolk before starting, or (better idea) overtime as you make eggs for any meal, save the eggs you’ve cracked and use those to make confetti eggs. Mix 1 cup of water, 1 tbsp of vinegar and food coloring. Dip eggs into food coloring – don’t be afraid to go crazy with the colors. Dip one half into red and the other half into green! Have fun with your color mixtures. Allow the eggs to completely dry once dipped. Fill the eggs with confetti. Cover the cracked hole with tissue paper and use glue to set the tissue paper in place. Let the eggs dry 2 hours or overnight. Have fun cracking the eggs! 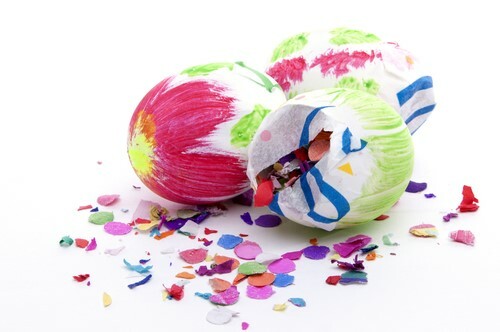 These DIY confetti eggs are perfect for birthday parties, Easter, Cinco de Mayo, or any celebration that needs some fun. Enjoy!